Living on campus at JWU gives you the opportunity to experience the best of Providence in a close-knit community. More than half of students live on campus. 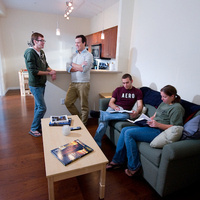 Most of our residence halls are centrally located. The Downcity Campus, in the heart of Providence, houses students from all colleges.